At least 65 people, including 11 police officers, have been injured during mass protests in Paris over President Emmanuel Macron's fiscal policies, including his decision to increase gas taxes, the AP reports. 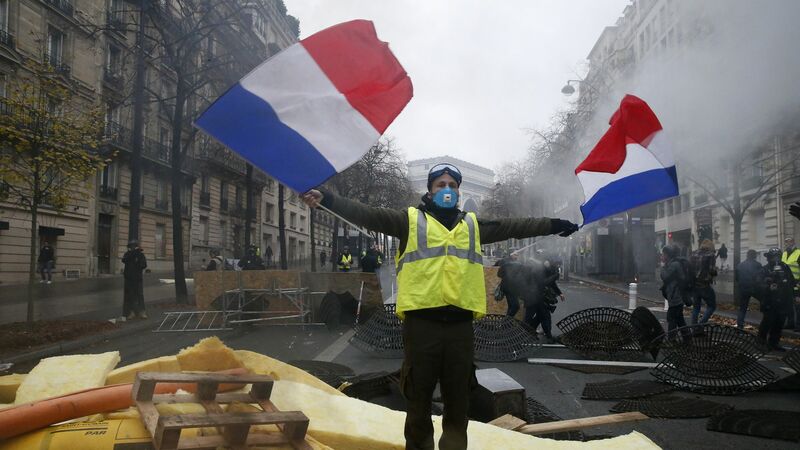 The big picture: This is the third straight weekend that "yellow vests" — so-called because of the jackets they must don to be permitted to block roads — have turned out to demonstrate against Macron, whose approval rating has plummeted to 26%. Authorities say more than 5,000 people gathered around the Champs-Elysees avenue to protest Saturday, with rare spurts of violence against police officers leading to 140 arrests.